Factual error: In the final scene where Congress is supposedly passing the bill, they are still in the committee room. Bills are not passed there, but in the actual meeting halls of the House and the Senate. Continuity mistake: At the end of the movie when Evan and God are talking under a tree in a field, God is holding a wooden staff. As the camera cuts back and forth between Evan and God, God's hand changes position from holding the top of the staff like a cane to holding the staff further down like a walking stick. Continuity mistake: During the flood, if you look at the clothes of the people on the ark, they are completely dry, despite several waves crashing over the boat, soaking them. Trivia: The book Evan gets his instructions from (Ark Building For Dummies) is an actual book which has been published! Mainly as a joke. 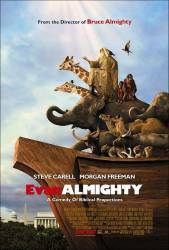 Trivia: There are multiple scenes in the movie showing the ark being built, and standing on land waiting for the flood. All of these shots of the ark before the flood was a real, life-size ark, built for this movie. Trivia: The scene where God appears in the backseat of Evan's car and they are both visible in the rear view mirror, is reminiscent of the movie poster for "Driving Miss Daisy", also starring Morgan Freeman, where Freeman and Jessica Tandy were both visible in the rear view mirror. Question: What was the bill, if passed, going to do? The one Long kept trying to pass and convince (The Senate I believe) the other congressmen to pass. Chosen answer: With it, Long would have been able to destroy the land, create another dam and get more houses built. However, like the first dam, he would have cut corners which would cause the new dam to eventually break. Question: Can anyone tell me where to find a list of ALL the music used in the movie? I'm looking for stuff that's NOT on the soundtrack. Chosen answer: All the music is listed in the ending credits of the movie. Answer: You can also find the titles of the songs at IMDB. An online movie database. Answer: When using IMDB, make sure you are using the "full site" and not the mobile version. At the top, above the movie/show title, click "more." Under "did you know?" click "soundtracks" (this list all the recorded songs used in the film, not just the songs on the soundtrack album). However, it often does not include incidental music, which is the background music or song created just for the film to create a mood, tone, or theme. Although often theme music that is later recorded and released will be listed on IMDB's page even though they didn't appear in the original credits, the same way (uncredited) actors are listed on the site.